Ask fellow campers about "Memaloose State Park" and nearby attractions. Good shaded park and wonderful views of the river. Oftentimes you will see grain barges and Stern wheelers passing by the park. Grass all through the park as well as many shade trees. Look for the Prune and Pear trees with editable fruit. Yes, there are PRUNE trees, not Plum trees. Sites are staggered so you don't look into the neighbors window. We camped at Memaloose State Park in a Fifth Wheel. Rowena Loops viewpoint is a must visit location nearby. Rate is based on Disabled Veteran Discount ($8 to make a reservation). 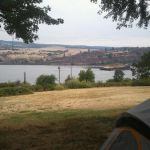 The park is down the hill from the Memaloose Rest Area right on the Columbia River. We checked in online and printed the parking pass and the receipt to put in the collection box. Our site (A4) backs up to I-84 so we got some highway noise but we didn't find it intrusive. The site is plenty long enough for our 39' motor coach but we had to park our car across the pad in front of us. I wouldn't call this a destination park unless you take advantage of the fishing on the river. The park has been here awhile so you only have 30 amp electric service. Not a problem with the breezes coming into the park from the river. For the holiday weekend this place was full all three nights. They did have some overflow parking for $10 a night. Like all Oregon State Park's reservations must be made well in advance on holiday weekends and this one during fishing seasons. We camped at Memaloose State Park in a Motorhome. Location was great, just above the Columbia river with beautiful views all around. The park is tight for big trailers but doable. The downside is that you are right on the interstate. The city of Mt. Hood is close with lots to do and see. We camped at Memaloose State Park in a Travel Trailer. A small Oregon State Park right off the Freeway. Access is difficult, if going East. It is on the West side with no on/off exits. One must drive a few miles to get East freeway access - not a big deal. The park is heavily treed with lots of grass. The trees hang over the interior roads and will scrape the top of large rigs. Otherwise it is well maintained. Staff is friendly and extremely helpful. The roads and sites are asphalt. Access is tight, but doable with care. There is a overflow parking area for trailers, boats, etc. There are several full hookup sites, all are back in. Utilities all worked well. No cable, no WIFI, ATT and Verizon good signal Personal WIFI worked well without booster. Down side is it is between the freeway and train tracks. It is very noisy, so would not stay their again. We camped at Memaloose State Park in a Motorhome. Absolutely NO quiet! Between the freeway noise and the railroad, you could hardly hear yourself think! Never, never again! The campsites themselves are not bad. There is very little privacy between the sites - the entire area is very open. The best sites are down along with water. You have a little less traffic noise and if you don't mind trains, you have a chance. The staff was very helpful. The area was kept clean and they were attempting to keep the grounds green by watering. There is ice on site which was nice since getting anywhere from the campground is a challenge. Keep in mind that the park can only be accessed from I-84 westbound and is located off the rest area. That means going eastbound you have to go three miles past the campground, use exit 76 and go under the freeway and head west back on I-84 before you arrive. Too bad there are no road signs telling you this. You do get a sign eastbound telling you to use exit 76, but then there was nothing. Found ourselves on top of a cliff with a 40 foot trailer thinking this was the way - there were no road signs!!! Just not my favorite site...sorry! We camped at Memaloose State Park in a Fifth Wheel. Beautiful state park on the Columbia River. There is no river access from the park, but there is plenty of access in the area. Close to fun and trendy Hood River, lots of water activities, wineries and beautiful scenery. the only drawback is the closeness to I-84 so there's quite a bit of highway noise. We camped at Memaloose State Park in a Fifth Wheel. We stayed 6 yrs ago and came back again. We love this park, would stay a month if allowed. Very helpful ranger...we picked a space and started to hook up and found sewer was backed up. Ranger came by at that moment and said darn, someone moved my orange cone. He said I am gonna move you to our emergency spot A59, backs to river. But could only do it for 3 days. Then we moved up top to A12 for 4 days. First space was 59' (largest they have) up top was 44' but large enough to put our 40' MH and full size car across front. Trains down by river would rumble some, no biggie and up top traffic was only noisy during day. By dinner, we would be outside eating and lighting a fire and traffic noise was very light. Only thing I don't like about the park is location. There is no on/off ramp for in either direction. You go to Hood River, you have to go far east almost to The Dalles to turn around and come back west to park. To go to The Dalles you have to go west to Mosier exit to go back east past park to get to The Dalles. Also wish trees were trimmed a bit more so can put out awning. Need more lights so tenters, etc. can see way to bathrooms or dog walking. Very dark at night! 2 hosts on site. One other small negative. B LOOP- to get onto B LOOP you have to take a turn that dips down and leans very sharp. Motorhome tail bottoms out at bottom of dip. Bit unnerving. Unfortunately B LOOP has most of the longer and full hook up sites. Would and will be back. We camped at Memaloose State Park in a Motorhome. Note: only 30 amp...use water filters for sure. Lots of pinecones around for firestarters. GO DO the Fruit Loop, great loop of wine tasting, fruit self picking, farmers, homemade pies, jams, marinades, handmade ice cream while you wait. Antique shops, Don't miss the Alpacha farm. They adorable and fun to feed. So much to do there...a month could go by real fast. Good location for visiting Hood River. Pretty state park, with nice views of the Columbia River-however (as others have mentioned) there is a bit of highway traffic and train noise in this state park. Even with the noise, which we found tolerable, we would consider returning the next time we visit the Hood River area. The highway traffic noise is noticeable through-out the park, with the sites directly along the highway experiencing the most traffic noise but conversely the least train noise (i.e., the screeching sound that occurs when a train rounds a track bend, but thankfully no train whistles). As would be expected, the train noise is more easily heard the further back in the park you stay. I do not consider this state park big rig friendly, but big rig possible. The outer loop around the park (less so the inner road) had trees trimmed high enough for us to drive down the road, but long RVs do need to watch as the go around curves in the road to clear branches on both sides of the road. Many of the sites did not have branches trimmed high enough for us, but many others with shorter in height RVs should be ok. The larger issue for longer RVs is the needed swing room to back into some of the sites. If the park is fairly empty, longer RVs would likely be ok, but if the park is full then those with RVs our total length would have a challenge backing into many of the sites. The widest road in the park parallels the highway and is in front of sites A3-A14. That road provides plenty of room to back into a site, but these sites are a little short for bigger rigs. A park ranger nicely moved us to one of the sites along the highway, which we could just squeeze into, after our reserved site B41 did not work for us due to low tree branches. 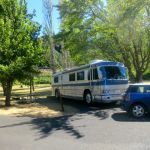 We did like this park--the above information is shared for the benefit of other long and tall RV owners. We camped at Memaloose State Park in a Fifth Wheel. Park hosts were helpful & friendly. As were the state park rangers. The sites were fairly deep given that this is a state park. our site "B-39 was 50' deep and our 36' coach fit just fine. The water pressure was excellent, But did smell of chlorine a bit. But that's better than drinking bacteria. The hook ups were located properly. The 30Amp power pedestal worked fine, although as it was very cool out and we didn't need A/C so didn't keep to close an eye on the voltage. The trains were not a bother at all as there are no crossings nearby. We only heard a bit of low frequency rumbling from the trains. The park does have a large population of Squirrels that are very friendly & always hungry. They really weren't a bother. But then as it was cool we ate our meals in the coach. The trees near the parks roads could use a bit of trimming for clearance. I scraped a bit while taking my car trailer to the overflow parking area. We would gladly stay here again. We camped at Memaloose State Park in a Motorhome. We stayed at Memaloose late in the season. The park would close two days after we left. Hence there weren't a lot of services. The park was most;y empty and quiet. We camped at Memaloose State Park in a Travel Trailer. Difficult access. You can only enter the park going westbound on I-84 from The Dalles. You can only leave westbound toward Hood River. So to travel in the area you wind up doing a lot of freeway exit reversals of course. No access to the river. There is a fence along the railroad right of way. Nice enough state park in a beautiful area. We were able to obtain a site for one night large enough for our 34' 3-slide 5th wheel without a reservation. All utilities worked well. The park itself was clean and quiet. The big drawback here was the proximity to the noisy interstate and the very nearby interstate rest area. We camped at Memaloose State Park in a Fifth Wheel. This is a very pretty campground that is also very noisy. The road noise is so loud we didn't have to feel bad about running our generator as we couldn't even hear it! It did quiet a bit at night, though. All the sites and roads are asphalt and in good shape. Ours was fairly level. The "tent" sites are plenty long for an RV, our site was occupied by an 38 foot fifth wheel before us. The tent sites have a water hookup. The flush toilets were very clean. It's a good place to stay to explore, but I wouldn't want to hang out at the campground. We camped at Memaloose State Park in a Travel Trailer. We enjoyed this park's location as a jumping off point to explore the area. The lawns were very poorly irrigated, though dust was not a major issue. Most of the lawns were dormant in late August. The large yellow jackets and ground squirrel populations are nuisances. I carefully picked a site based on an aerial photo to enjoy some afternoon shade; the tree turned out to be dead, though still standing. The showers are free. The water in the showers and at the sinks is temperature-controlled warm water. They provide paper towels. We camped at Memaloose State Park in a Travel Trailer. The view across the river is wonderful. We've never stopped here before and didn't know it existed, but we will come back. We reserved one of the longest sites (A9) which backs up practically to the freeway, but we don't mind the noise. Our TV dish worked! Down into the park further it would not have. We can see bits of the Columbia river and the Gorge from our front window. Didn't notice the train noise. Walking thru the park was good exercise. Lots of tents - 110 sites, in addition to 44 full hookups. We camped at Memaloose State Park in a Motorhome. Nightly rate is 0 because I am entitled to a special access pass which allows me to camp for free 10 days a month, max 5 days in a row. Lots of space but hot, hot, hot since we had a partially shaded spot. Lots of noise from the highway and the train. Bring earplugs! Plenty of space to play. Dogs on leash not enforced. Entrance/exit a little strange because of how the highway exits are arranged. We camped at Memaloose State Park in a Tent Trailer. See the Columbia Gorge Discovery Center. Spooky's Pizza in The Dalles has great pizza. Columbia River Gorge is incredible with waterfalls galore (especially the amazing Multnomah Falls) and don't miss the historic scenic Highway 30, Rowena Crest viewpoint and every other stop along there, Mosier Twin Tunnels, watch the windsurfers in Hood River, train ride around Fruit Loop - there's so much to do here, you could never be bored. Numerous actities to do from here: Mt Hood, Lost Lake, Bonniville and The Dalles dams; the town of Hood River, Cascade Locks. We used this camp for a base camp for day trips on our motorcycle. There is no other reason to stay at this park except it is close to the water falls and fish hatchery. Are you affiliated with Memaloose State Park ?